Due to my limited budget, I wasn't able to print these large posters in the beginning. As a result I launched a Kickstarter campaign called "The Ramen Poster." Surprisingly, the project attracted many ramen lovers around the world. Within 30 days, the project was finally funded by 438 backers with over $15,000 pledges on May 30, 2015. Stamp will be located on upper right corner of poster. If you prefer no stamp on the front of poster, please select "Back of poster." Please read comments and reviews below about my works and designs! Thanks for stepping by! Hi Joe, I will figure something out about a digital version or maybe a smaller size poster. Hi Lipe, Thanks for pre-ordering The Ramen Poster! I received your payment through Paypal a few days ago and sent you an email about the payment confirmation. I just resent it again right now. If you can't receive it, please email me through myramenhouse@hotmail.com. I am very sorry for the late response! I would love to have this in a smaller size. Hi Timeeka, thanks for your comment. There's a possibility that I might include a smaller size of the poster on my next Kickstarter project. Thank you for your interest! Got my posters today. Both backgrounds look very beautiful and I really love the traditional one with the stamp. Thank you Fanny! Hi Cindy, you are very welcome! It's great to hear you love them! 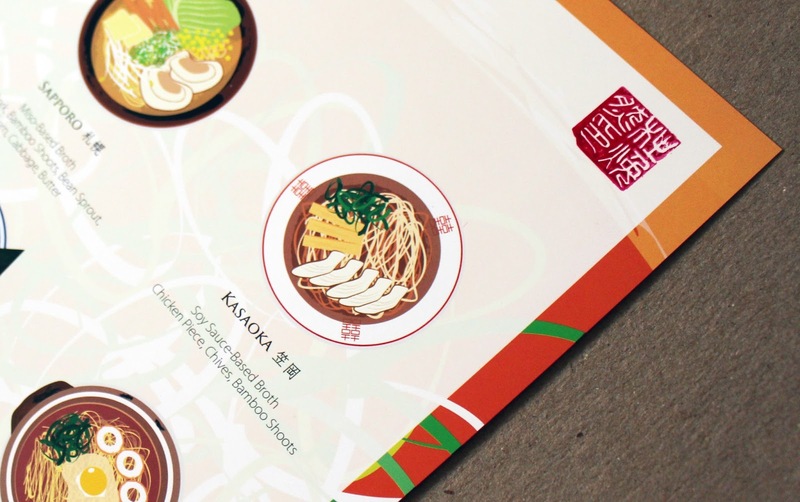 Hi Flora (walkcompany5054), thanks for your interest in The Ramen Poster, I just sent you an email about the inquiry. Delighted with my poster. Exactly as expected. My only problem is that I should have bought two: one for home and one for work! Cannot decide where's best. Hi Brendan! It's great to hear you like them both! I will launch a new Kickstarter campaign next month with a new Japanese poster design. The campaign will also include the ramen poster too. Hope you will be able to stick around to take a look. Happy eating!! Hi Audrey! Thanks for asking! The shipping package for the poster is a 24-inch long 3-inch diameter tube. Inside the tube, I wrap it with bubble wrap already. I suggest placing the entire tube inside the luggage bag because the tube is very rigid. Good communication! I ordered the poster last week and received a confirmation email to make sure they have the right address. I just moved so Paypal still uses my old address. It was cool that I can email back and change the address before it's too late. I got the festival one and the poster quality is excellent. Will recommend the poster to my roommate who also loves ramen. Thanks for ordering Jarold! I am glad that you emailed me your new address before I ship your poster. Hope your roommate like the ramen poster too! Hi. How long is shipping? I was hoping for a quick shipment. Thanks.